The book is a unique treasure-one of its own kind, which is the result of a painstaking study carried out by the author. The book describes in details, the plants depicted in Hindu, Buddhist and Jain temples all over India-from the Indus valley civilisation to the 17th century-trees, creepers, leaves, flowers, foliage, fruits etc., sculpted on walls, pillars, and doors. It describes 74 types of plants, supported by nearly 300 plates including a number of photographs of living plants for the sake of comparison with the plant sculptures in temples. This comprehensive work which gives the botanical, popular and family name of each plant, describes on a systematic basis, the history, antiquity, rituals and beliefs associated with the plant and the reason of its being sculpted on temples. The book also explores the literary references to various Indian plants, flowers and fruits and highlights the myths and rich traditions, some of which are still living. Shakti M. Gupta is an established author having written on varied subjects. A Botanist by profession, she taught Botany at Dyal Singh College, University of Delhi and retired in 1992 as a Reader. Dr. Gupta did her Ph.D. in Botany from the University of Delhi in 1958, subject of specialization; Physiological and Biochemical Studies in the Pre-sowing Hardening Treatment of Crop Seeds. In 1972, Dr. Gupta did another Ph.D. from the Faculty of Oriental Archaeology, Martin Luther University, Wittenberg-Halle, Germany. The subject of specialization: Plant Myths and Traditions in India. This qualified her as an Ethnobotanist. Her other books are: From Daityas to Devatas in Hindu Mythology: An Illustrated Dictionary; Vishnu and His Incarnations; Legends around Shiva; Surya, the Sun god; Karttikeya, the Son of Shiva; A Short Biography of the Renowned Palaeobotanist, Professor Birbal Sahni; A Comprehensive Volume on Festivals, Fairs and Fasts of India. Her most recent book, Plants in Indian Temple Art, is based on a survey of plants sculpted on Hindu, Buddhist and Jaina temples, including the myths, legends and folklore associated withu these plants. 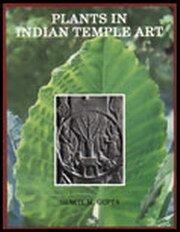 The Association of Plant Taxonomy awarded her the Jnan Chandra Memorial Medal for the year 2000 for the book Plants in Indian Temple Art. Bibliographic Information: xiv+242p., Figures; Plates; Charts; References; Abbreviations; Glossary; Bibliography; Index.